A new year is almost here. Perhaps one of your resolutions will be to do a short daily devotional. If so, start the new year right ... with me! 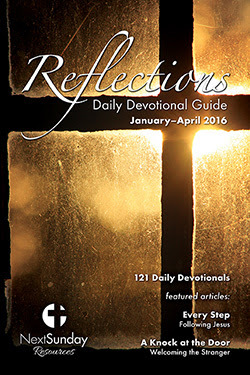 I wrote the first seven devotionals in the new Reflections devotional guide (published by the Smyth & Helwys imprint NextSunday Resources). You can buy the January-April guide on their website or get a kindle version from Amazon. Each day includes a short story or reflection on a biblical passage and a brief prayer. I hope January 1-7 will bless many people. I'm sure the whole quarter is good and I'm looking forward to reading them each day.